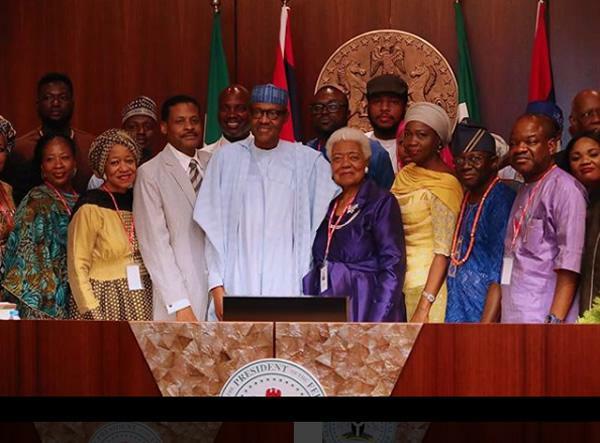 Several Nigerians invaded the social media space on Thursday, condemning the roles allegedly played by some presidential aides in the controversial award for President Muhammadu Buhari by the Martin Luther King center a few days ago. Pictures of the delegation from the centre, The King Center, presenting the award on behalf of the family of legendary American civil rights activist to Buhari at the Presidential villa, found their way into the media space hours after the visit. Obviously uncomfortable with the development, The King Center tweeted on Wednesday, dissociating itself from the award. The development ignited a series of unfavourable comments from members of the public, especially when an online platform, Leaders NG, published on Thursday that the Nigerian government might have paid up to $3m to procure the ‘fake award’ for the President. Following the outrage, Senior Special Assistant to the President on Foreign Affairs and Diaspora, Abike Dabiri-Erewa, hurriedly issued a statement on Thursday to defend the award. She explained that the award was in appreciation of the President’s fight against corruption, noting that the visit of the MLK family members to Nigeria was not sponsored by the Federal Government. Dabiri-Erewa in the statement by her media aide, Abdurrahman Balogun, dismissed insinuations that the government paid money for the award, stressing that nothing could be further from the truth. “It must be categorically stated here that the trip was totally privately funded and not one kobo was spent by the Nigerian government,” she said. The Presidential aide also clarified that the commemorative plaque given to Buhari was presented on behalf of the Martin Luther King family and not the TK Center as being speculated. The statement read in part, “Our attention has been drawn to obviously fake online news reports on the visit of some members of the MLK family to Nigeria. “The members, led by the Matriarch of MLK, Naomi Barbara King, were in Nigeria as part of the activities initiated to celebrate a low- key Black History Month in Nigeria as part of deepening partnership between Africa and its diaspora. The statement further stated that the Americans enjoyed their visit and they decided to extend their stay by two days, noting that the political endorsement of Buhari by a member of the MLK family was done in his personal capacity. “As a non-political group, he was asked to refute the statement, which he refused to, insisting that it was his personal opinion, and not that of the family nor that of the centre, of which he has been a board member and the Chief Operating Officer for over five years. “This may have led to some arguments among them, which they have said they will resolve when they get back to the United States, which apparently led to the tweet being circulated,” it said. But the Leaders NG, in its report, alleged that the award was facilitated by Dabiri-Erewa, through a Ghanaian self-acclaimed foreign diplomat, Dr. Erieka Bennett. According to the report, a quick fact-check on Erieka Bennet revealed that she runs a non-governmental organisation, called, Diaspora African Forum, based in Accra, Ghana, and that she used her influence to facilitate foreign awards for unsuspecting African leaders. The online newspaper further alleged that Bennett was contracted by Dabiri-Erewa to bring Martin Luther King Jnr’s family to Nigeria to present an award to Buhari. In his reaction on his facebook page, An Associate Professor of Journalism and Emerging Media in the School of Communication & Media, Kennesaw State University in the USA, Farooq Kperogi, condemned the action which Buhari’s aides played in the saga. Kperogi wrote, “Nigerian scam artists, led by Abike Dabiri, got some Black American hustlers from Atlanta to pose as close relatives of the late Dr. Martin Luther King Jnr. and presented a fraudulent “Black History Award” to Buhari. “First, Coretta King, Martin Luther King’s wife, died on January 30, 2006. I know Buhari gives appointments to dead people, but in America dead people don’t give awards. Second, Black History is celebrated in February, not March, in America and Canada. “The extent the Buhari government is prepared to go to court of embarrassment and ridicule Nigeria in its bid to conceal its crying incompetence is simply astounding. Also, one Aminu Farooq, said, “This fraudulent award didn’t come to me as a surprise. Nigerian leaders are always vulnerable when it comes to these types of awards. My father had been chief executive officer in a Federal Government establishment in Nigeria. In 2016, former President Goodluck Jonathan became the first African leader to be given the Martin Luther King human rights award. However, the Peoples Democratic Party described the saga as a national disgrace and embarrassment. The PDP, in a statement by its National Publicity Secretary, Mr. Kola Ologbondiyan, on Thursday said the lie by Buhari’s handlers smacked of what it described as a desperation by the presidency and the All Progressives Congress to procure international endorsement,ahead of the 2019 elections. Ologbondiyan said the embarrassing act had made the nation a laughing stock before the international community. He said, “It is now clear that this sinking, incompetent and deceptive APC administration, in their desperation, can fabricate and stage-manage anything, including name-dropping of international figures and agencies, in their desperate attempt to delude Nigerians again, now that the 2019 general election is fast approaching. “Nigerians have discovered that having failed to gain any endorsement from reputable international figures such as Bill Gates, the APC and the Presidency have now cheapened the nation by resorting to this despicable act of name-dropping of world-renowned human right activist, Dr. Martin Luther King jnr., further dragging down our once sterling image before the comity of nations. “The fact remains that not many Nigerians believed in the authenticity of the award in the first place, as the Buhari-led administration, by its undemocratic and anti-people proclivities, including records of violations of rights of citizens, is not deserving of any form of recognition by any human rights group, let alone the family of the world-acclaimed Martin Luther King Jnr. Ologbondiyan recalled that the PDP had issued a statement, earlier this year, cautioning Nigerians and the international community to be wary of information and claims coming from the APC and the presidency, particularly on endorsements and performance indices. While he urged the Presidency to shed its alleged proclivity for lies, he also demanded the immediate arrest, investigation and prosecution of all the Presidency officials involved in this messy scandal and crime against our nation. “Moreover, the Presidency and the APC should save the nation from further embarrassment by jettisoning other planned endorsement stunts and fabricated performance indices, as Nigerians are already rallying with the repositioned and rebranded PDP in their collective quest to end the misrule of the APC and restore a sincere, purposeful and people-oriented government come 2019,” he added.